1. Begin by cutting a piece of Dovecraft Winter Blooms 8x8 paper down to 15cm x 15cm. Adhere this with Dovecraft Perma Fix Tape to the centre of your Dovecraft 6x6 white card blank. 2. Die cut the largest die in the First Edition Scalloped Circle Nesting die set onto a coordinating piece of Winter Blooms paper. Cut in half and adhere each piece to the left and right side of the card. 3. Using the same die, die cut it once more on to a complementing sheet of Winter Blooms paper and adhere it with Dovecraft Perma Fix tape to the centre of the card design. 4. Choose one of the Scalloped Circle Nesting dies in the First Edition dies set to cut out your ‘Joy’ sentiment topper. 5. Use a fine liner to add a faux stitch line to the edge of the topper. 6. Adhere the topper with 3D foam pads to the centre of your card design. 7. Stick a Dovecraft Winter Blooms gem to each corner to add a splash of colour! This joyful card will be a treat to open and is so easy to make! 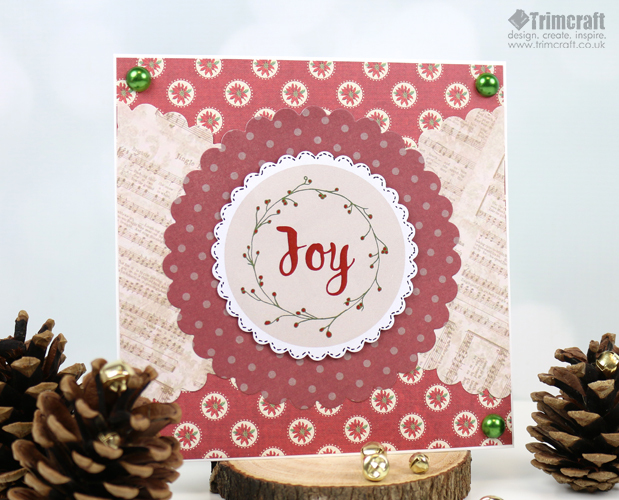 The sentiment toppers work wonderfully with the traditional Winter Blooms papers. Alternatively, you could use the Simply Creative Christmas Cheer papers and Winter Bloom embellishment to create an equally stunning card! This layered make will look pretty on any mantel piece this Christmas! We would love to see your makes using our Advent Calendar freebies so when uploading to the inspiration area make sure to tag Trimcraft-Advent and when uploading to social media, to #trimcraft.